Friday, October 9, 2009: The forecast was for an inch of snow that evening, so Leslie and I took off early for a late afternoon SCUBA dive at a site called Padi 79 near Crosby, MN. Didn't see a lot of fish but did run into two nice sized bass that called this welding platform home. 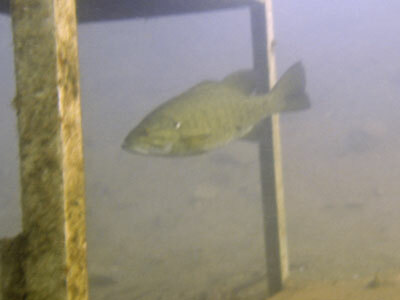 Did get this photo of one bass. Saturday, October 10, 2009: On a frosty morning with a one inch snow fall the night before, 13 hardy soles went to the Portsmouth access for a fun dive run by the Minnesota School of Diving. My diving partner was Michael Flanagan who drove up from St. Louis, MO. The water temperature was a balmy 54 degrees and visibility wasn't too bad considering this photo was taken without a flash in about 30 ft of water. 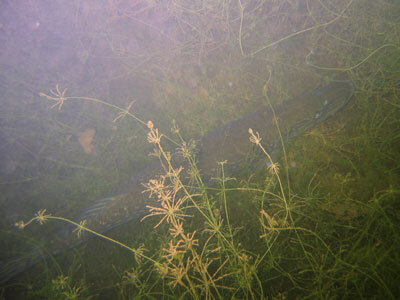 We did run into this nice northern. 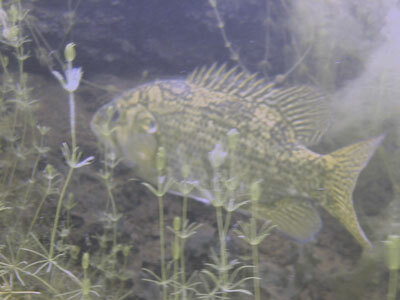 On our swim back to the entrance we ran across this crappie. Haven't seen a lot of these in the mine pits but this one was quite colorful. Bashful - he wouldn't turn around for a nice photo. We didn't really get cold until we came out of the water and started to take our gear apart, then our hands started to numb up nicely. Quote of the day: You can never do too much diving.